This spring in WNY has been miserable to work outdoors. Since the first of January, we have had only four decent Mondays to work outside in Hamburg. However, on March 26th, Rick Burns and I did get a lot accomplished inside the BSOR shop. 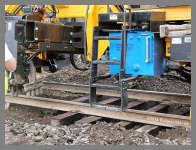 We were able to use the railroads 12 ton crimper to assemble electrical cables. On a great day in April, we re-installed the two cleaned fuel injectors on prime mover with new oil rings. The high and low pressure fuel lines went right back into their fittings without a problem. 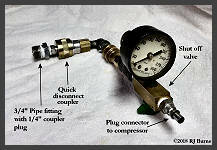 Over the winter, Rick and I designed a compression tester tool which Rick assembled with fittings he had at home. We want to get a reference point to see if all six cylinders hold pressure for about the same length of time. The process is pretty simple. 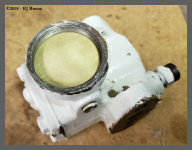 Using a gasoline motor compressor, we put 100psi of air into the cylinder through the tester into a cylinder port. After pre-lubing the engine, we barred the crankshaft to move the piston to top dead center on the power stroke so that all four valves were closed. 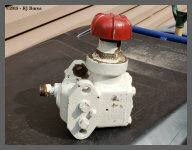 When the gauge reaches 100psi, the valve is closed and we time how long it takes to leak down to 50psi. No one knows how many hard working hours are on the prime mover since its last overhaul, so we are just looking to see if we have a problem with any of the cylinders. With over 5 hours of total running time on the engine since July 2016, we do not anticipate any serious issues. 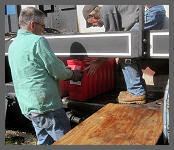 While Rick and I worked on top of the locomotive, Bob Martin applied his carpentry skills to repair our old saw horses. 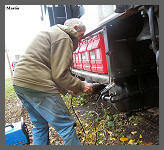 Jim Long spent the afternoon scraping crud off the traction motors underneath the engine. 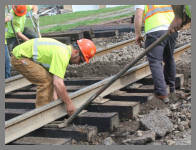 The Buffalo Southern Railroad (BSOR) has contracted with "Delta Railroad Construction, Inc." to replace 2000 ties along its 32 miles of track. 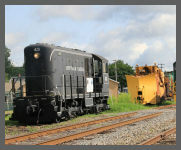 One of our crew members, Robert Martin, was on hand to photograph one days work on May 2nd. The ROW under the small service road behind BC#43 had sunk and needed 10 new ties to bring it back to grade level. A "Cat M318" made short work of removing the old dirt and stone fill. As the excavator uncovered the old ties, it became readily apparent how deteriorated they had become. 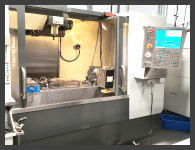 All of Deltas' equipment is first class and their like new "Nordco" Tie Remover/Inserter was very impressive. 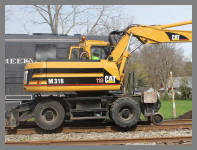 The operator was able to quickly remove the rotted ties and install new ones which the crew later spotted along the crossing with their Cat M318. 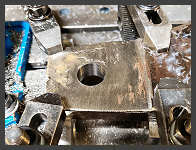 The "Nordco" Tie Remover/Inserter removed a few of the ties in one piece but most of them splintered into pieces which the crew removed by hand. Once the roadbed was clear, the inserter grabbed a new tie and the skillful operator worked it under the rails. When all the new ties were in place, the Delta gang lifted the rail and reinserted the tie plates. After all the tie plates were inserted, the crew went to work using a pneumatic spiker. 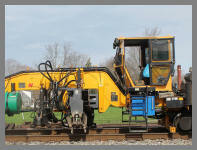 The guage of the railhead was check numerous times to ensure that they had 4'-8 1/2" between the rails. 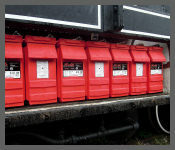 When all the ties were secure, a load of ballast was dumped and spread to complete the job. We are not sure how the service road will be completed. On May 7th, with freezing weather behind us, we again filled the cooling system. We ran 175 feet of hose from the "ArtCraft Toy Trains" depot to the locomotive and in less than an hour had filled the system, or so we thought. In less than an hour, there was no water in the expansion tank. No water was leaking so where did it go? After numerous system checks, we found the water pump was parked just at the right spot to block the outlet port and only allowing a trickle of water into the block. After rotating the engine crankshaft a quarter turn, the water began to flow. As hoped, again we had no leaks. 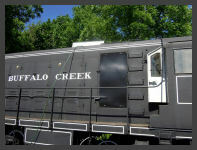 Our thanks go to Rick Fisher from ArtCraft Trains for allowing us to "borrow" the 285 gallons of water needed. The rest of May was spent cleaning winter grime from the locomotive and securing cables under the frame with custom made wooden insulation clamps. The 5/8" hanger bolts on the frame had to be straightened and the threads "chased" with a thread cutter. Jim Long did a great job scraping crud from the frame and then priming and painting all the new hardware and clamps we needed. He and Bob also added four newly fabricated wire rope hangers. In May we had to shift our focus from #43 to our other work site just down the tracks. 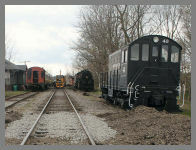 The Society was informed that we needed to move our 1896 NYC Wood Caboose and the 1910 Michigan Central Baggage/RPO off of the siding property just down the track from BC #43 and PRR #4483. On June 5th, I went down there and took notes of what needed to be done before the cars could be moved. On June 12th, Rick B. and Bob M. went down with a chain saw and loppers to start getting the trees and brush away from the cars so people can gain access to them. A second attack was performed on the 19th with still a lot more clearing to go. On Saturday June 23rd, another work party broke through jungle. A huge thank you has to go out to Don and Barb Owens for recruiting Caryl Youngers and Paul Mayer for their extra effort in getting the rest of the clearing done. Caryl had a "brush wacker" with a steel blade while Don and Paul used chain saws on the saplings. Barb followed up with lopping shears clearing vines and entangled branches. We now have a 3 foot wide access path down the entire length of our cars. The Society is now awaiting quotes from several vendors as to the cost of trucking the cars from Hamburg to the Heritage DiscoveRY Center at 100 Lee Street in Buffalo. July 2nd was spent taking care of minor details on the clamps under the locomotive. We also made a short trip down the tracks to our storage site to get some materials. The BSOR was informed in June that the "James E Strates" Fair Train would be arriving early and that they needed to make room to store the over 45 flat cars from the train. We were very anxious for our first start up of the year so on July 9th we decided to try the fully charged 12 used batteries we had on board. Once we had the engine pre-lubed and barred over, we pulled the six compression plugs on the cylinders. The prime mover seemed to roll over easily as we held the start button. The compression plugs replaced and the fuel pump was turned on. "Thunk..thunk.......thunk..............thunk, was all we got. Sadly, not enough reserve power in the batteries for the engine to catch, we had to try! So a call was put out to our awesome friends at the Buffalo Southern Railroad to see when they could fit us into their schedule. Pat C. said that Saturday, July 28th looked good so we said we'll take it! July 16th turned into scorcher with high humidity at 90' so very little work was accomplished. Saturday, July 28 turned out to be beautiful day under partly cloudy skies at 73'. The four of us arrived early to prelube the prime mover and remove the weather covers from the radiators, fan and electrical cabinet. Since our last jump start up was on October 21st, 2017, we were ready at the governor control rod to add extra diesel fuel if needed. 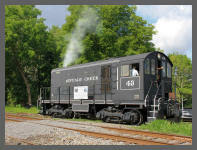 Pat Connors arrived at 9:00am sharp and connected his jumper cables to the battery switch on BSOR #100 a 1945 ALCO-S2. We connected the other ends to the negative side of our battery switch and to 64 volts on the positive side of our battery bank. After letting #100 charge our batteries for five minutes Rick Burns hit the starter switch. After six quick "thunks" the engine came to life! Since the cylinders had not fired for almost 9 months, a lot of fuel and oil had collected in the cylinders so for the first five minutes we had quite an ALCO smoker! When the engine had warmed up to 150 degrees, it ran smooth and quiet with no smoke at all. With the Battery Ampmeter reading 20 amps we turned on the air compressor until it shut off at 95 psi and tested the brakes. Pat jumped into the engineers seat and gave the throttle a pull...... the prime mover sped up and the traction motor relay pulled in, but nothing else happened. We pulled the cover from the big relay and touched up the contacts and tried again moving the Forward/Reverse Controller as well. This time the "+/-" generator relays pulled in but again no movement. Their contacts were cleaned up and we gave it another shot. As Pat pulled the throttle, a shudder was felt by all, we had moved! Reverse first for a few feet and then Pat tried forward, nothing. Reverse again for another few feet but again no forward movement. One more time in reverse and again forward and we were moving! With each forward/reverse move, the oxidation on the controller, the relays and the commutators on the traction motors was removed and the throttle response was immediate. For over two hours we burned up almost 15 gallons of diesel fuel as we happily ran back and forth on the 80 feet of siding between PRR I1sa #4483 and the BSOR Jordan Spreader. 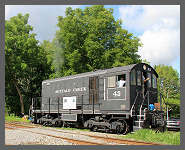 I'd be remiss if I did not again thank the Buffalo Southern Railroad management and Pat Connors for all their help and advice in bringing us to this point in the restoration of #43. Thank You Pat! Society member Kevin Walters was on hand to capture all the action. Thank you Kevin! Of course a few minor issues that we need to address revealed themselves with the movement and we still need our own set of 14 new batteries. Fundraising options are being discussed as we move forward! I'd be remiss if I did not thank again all the people who helped make this milestone event happen. When I first started this restoration by myself in 2005, it quickly became apparent that I was going to need some help. 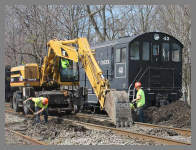 First, I have to thank Marv Winter who gen-erously donated his crane service and crew to remove and replace the leased roller bearing trucks with freight car trucks. On the weekend of June 10th, 2006, he gave us the use of his shop, tools and overhead crane, after he had moved the four traction motors, frames and other parts into his building. A big thank you goes out to Pat Connors, Jim Long, Al Olmsted, Rick Henn, Dave Fleenor and Mike Fitzsimmons pictured left to right. That's me on the far left and Bob Snyder is behind the camera. In one weekend, both trucks were fully reassembled! This was my first meeting with Pat and he has become an integral part of our success. Rick also introduced me to Jim Long as well as others over the years and I really appreciated that help Rick, thank you. From that day, Jim became my #2 crew member and has been a real asset for the last 12 years. Thank you Jim for your dedication and help! 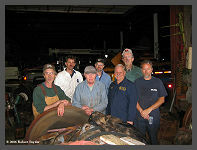 After Jim and I finished assembling the two trucks, Marv Winter again donated his time and crew to lift the locomotive and install the trucks under the locomotive. 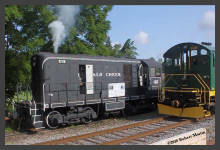 In the fall of 2009 Dave Clark of "Dave Clark Railroad Service" gave us a generous break on the cost of turning the eight wheel flanges on the trucks which caused us to fail a required FRA inspection. 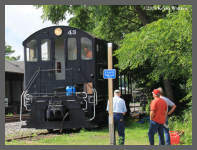 Once we received the OK for a one time move, the BSOR with Pat Connors at the throttle, moved the locomotive for free up to Hamburg behind the ArtCraft Toy Train store in the old Erie Railroad Depot. A big thank you to Kevin O'Gorman, president of the Buffalo Southern and Bert Feasley, vice president of operations for allowing Pat to help us when ever needed. A shout out also goes to Rick Fisher, owner of ArtCraft, who has gen-erously allowed us the use of his electricity, water and advice for the last nine years. Thank you Rick! 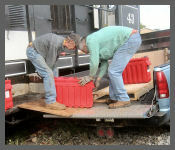 Over the past 36 years, the Buffalo Southern Railroad has been an invaluable source of support by moving and storing our rolling stock as well as the use of their equipment, tools, batteries and advice. Without their help, we wouldn't have an operating locomotive. Thank you once again! Thank you John Mech, "Railway Flyer" editor emeritus, who donated a very valuable box of early ALCO manuals, bulletins and apparatus documents in 2010. Since the beginning, John has been a big promoter of our progress. In 2011, Rick Burns became a part of our now three man crew and has brought years of mechanical skills to aid in our success. Bob Martin became a regular part of our crew in 2012 and a generous benefactor. Thanks again Rick and Bob! To date the entire restoration has cost the Society under $2300 for the wheel work and paint supplies. Everything else has been purchased with the large and small donations of Society members, friends of the Society and our four man crew. Special thanks to life member Jim Szymanski who paid for the black paint, supplies and pin stripping on #43. And last but not least, as of this writing, Life members of the WNYRHS, Don and Barb Owens, have generously offered to buy a complete set of batteries, at considerable cost, for #43. Another gracious Thank You to Don and Barb for giving the Society the ability to offer an operating attraction and selling point that the WNYRHS can point to with pride. Thank you one and all! With the funds made available by Don and Barb to purchase new batteries, we set out getting quotes from as many vendors as possible. Unfortunately, this turned out to be a lot more work than anticipated. Many vendors never replied or took a week or more to respond to questions. It took over three weeks to get four different vendors to supply prices and fortunately, one vendor did stand out far and above the rest, "3Sixty Mission Critical, Inc." in Waunakee Wisconsin. Their sales representative, Mark Pahs, was by far the most helpful and accommodating to our requests and came in with a price, $1000 less than all his competitors for a set of "Rolls" batteries. 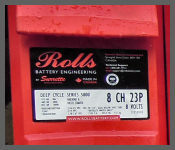 "Rolls" batteries are made by the "Surrette Battery Company Ltd." in Springhill, Nova Scotia. After comparing them to "Deka," "Crown," and "GNB" made by "Exide," we found they would work perfect for us so the order was placed on September 4th. During one of our many trips back and forth we noticed that there was excessive travel on the fireman's side brake cylinder on the rear truck. A quick inspection on August 6th, reveled that the clevis pin hole in the lower transition brake lever was excessively worn. 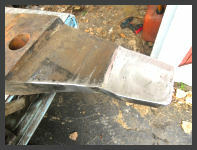 The 60 pound cast steel lever had to be removed and repaired. With only 5" of space to work under the truck, it took a lot longer than we anticipated to remove the lever. 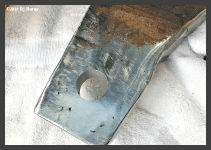 Since the hole was worn to twice its size from 60 years of use, it needed to be be filled with a piece of 1" steel bar stock. At home, I pre-heated the entire piece to 300 degrees, dropped the bar stock into the hole, and MIG welded the hole closed a little at a time from both sides. When it had cooled enough to handle without smoking my gloves, I ground it smooth. 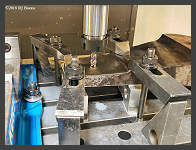 We couldn't just drill the 1.25" clevis pin hole with a twist drill so we needed a vertical mill to do the job. Crew member Rick Burns is a retired "Master Machinist" and still has friends in the industry. A huge "Thank you" goes out to Doug Webster of "Peak Motion, Inc." for helping us out. 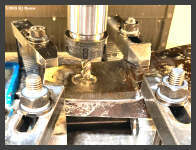 He had his machinist Owen Landon mill the hole on a "Haas 4 axis Vertical Mill" in less than an hour. On the 20th, Rick and I reinstalled the lever after it was primed and painted. A liberal coating of grease allowed the lever to slide into place with ease, but that was the easy part. Getting the clevis pins into the holes while fighting the weight of the brake shoe hanger and the weight of the lever proved to be a challange. Not being able to see the holes from underneath, meant everything had to be done by feel. A drop pit would have been nice! But once the 3/8" cotter pins were opened, we were able to adjust the brake piston travel back to the recommended two inches. When Pat C. was in the cab he noticed that our brake cylinder pressure was way too high. In front of the control stand are two regulators. 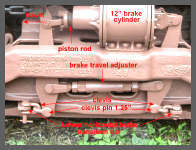 One for the "Independent Brake" which is for the engine and one for the "Train Brake." The red pointer should be around 30 - 40 pounds. Unfortunately the one regulator for the locomotive has been stuck since we received the locomotive. Rick B. removed the valve and took it home for rebuilding. At home, Rick disassembled the valve and found the issue. 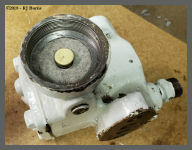 A felt seal support had disintegrated and fell into the bottom of the regulator body preventing the brass seal plate from closing. After a thorough cleaning, Rick made a new felt support and reassembled the valve. We reinstalled the valve which now turns freely and will be able to adjust it on our next run. In anticipation of the new batteries coming, Jim Long and Bob Martin, repainted the two battery compartment covers making sure to preserve the pinstripping. 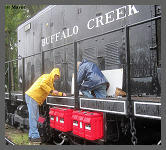 The 14 batteries were delivered safely to the Buffalo Southern Shop on September 14th so I scheduled a crew to move their 12 loaner batteries back to the shop and haul the new ones to the locomotive. On the 24th, the four of us began the "back-breaking" process of sliding the 12 loaner batteries out of the battery compartment and onto my 1/2 ton Chevy truck. Silcone spray on the plywood ramp made moving the 275 pound cases a "little" easier four on each load. Once we had 1,100 pounds of batteries on my truck, we went down to the BSOR shop to return them and pick up four brand new "Rolls" batteries. We slid the four new ones off the truck and into the battery compartment. We then removed four more old ones. After repeating the entire process three more times, we had moved a total of 7,150 pounds of batteries or 3.5 tons in just under three hours. 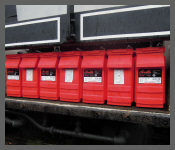 After the last of the 14 new power packs were in place we called it a day. 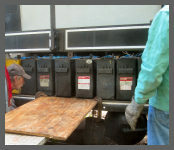 On a rainy cold October 1st, Rick, Bob, Jim and I reinstalled our 13 original jumper cables to the battery banks. We used new 5/16" stainless steel fasteners with "NoOx" corrosion inhibitor on all the terminal ends. After the main +/- cable ends were attached, we were ready to start the engine! After a quick "pre-lube" with our on board oil pump, I stood ready at the governor as Rick hit the starter button. We quickly got a real life experience with a "weak link" in a chain reaction. "ZZZZZZZit" POW! One of our jumper cables blew up right behind me! After the smoke cleared we saw the separated cable with a clean cut at the terminal end. Upon closer examination, we saw green corrosion inside the terminal end crimp which put our fears to rest that we had cooked a battery even after triple checking all our connections. We soon had another good cable bolted in place and tried again. Success! The engine turned over faster than it ever has before and roared to life. Another milestone was crossed as this would be the first time #43 has started unassisted since 1999. With the engine runnng, I adjusted the voltage regulator to 124 volts which is the suggested 10% over 112 volts charging rate. Rick adjusted the "independent" brake pressure regulator to 40 psi. Two quick "wonk's" on the horn and we were on the move! (only 60 feet of course) Everything worked like ALCO intended. 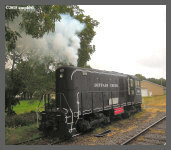 Being able to start the locomotive when ever we work will allow us to troubleshoot minor issues at any time. First up will be a complete 82 gallon oil change with fresh diesel rated 40 weight oil. Crew member, Jim Long has graciously agreed to pay for the oil change which we hope to complete before the end of the month. Depending on how long our warmer weather holds out, we may not have to drain the cooling system until the end of October. Our ultimate goal is to have the engine ready for an FRA inspection in the spring. 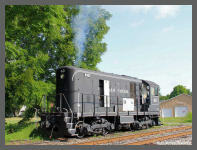 This will allow the BSOR to bring #43 out onto the mainline and to do some work! All kinds of ideas are being talked about but we don't want to count any chickens until they hatch, Ha! On the 8th, we planned to do the oil change. So bright and early we fired #43 up and ran it up and down our short piece of track to warm up the engine. Unfortunately, our oil supplier called and told us delivery would be delayed until the 17th. 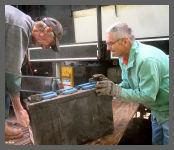 We did install battery spacers on both sides of the locomotive and Jim L. chased the threads on the 28 battery cover nuts. October 17th was cold and dreary so before the rain moved in we planned a short day. The nuts on six battery cover holes were either messed up or missing all together. Bob and I drilled out the holes, ground off the weld spatter and welded in six new nuts. We finished up just as the rain moved in. On the 22nd, Bob Martin and Jim Long, started the engine to let the oil warm up to drain the crankcase. After a half an hour, they shut the engine down for the last time this year. 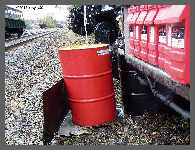 Two empty 55 gallon drums were spotted under the drain valve. In less than 20 minutes, the drum was three quaters full so they switched to the empty one. While it was filling, they opened the water drain valve and emptied the cooling system. We have been flirting with low thirty degree temperatures so no sense in taking chances. With below average temperatures almost all of November and most of December, our crew in Hamburg spent little time outdoors with our equipment. This happens every year with the Holidays, our Train Show and getting plowed in with snow banks. However it's never too early to make plans for this coming spring. 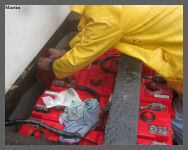 On November 5th, we returned to install the radiator weather covers and moved the used oil in drums down to the BSOR shop. Our generous benefactors of the batteries, Don and Barb Owens, stopped by to pay us a visit. 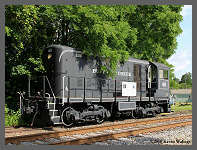 Our big "37th Annual Greater Buffalo Train & Toy Show" was held on the 17th and 18th, just before Thanksgiving. The oil used oil was moved down to the BSOR shop so they could use it in their oil furnace. We also pulled one crankcase cover to check out the bottom of the oil pan. As expected, there is a half inch of decades old crud on the bottom that needs to be scraped out. No sense in putting new oil on top of old contaminants. 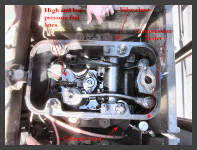 A new oil filter will be installed and the engine strainers removed, cleaned and replaced. 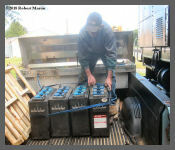 We have trickle charged the batteries twice to keep them ready for the spring. We are making a list of items that need to be serviced and or certified before we can call for a FRA inspection. We really hope to spend more time with #4483, our steam engine, which still needs a boiler jacket and our NKP and DL&W cabooses require window and woodwork. There is plenty of simple work to do on all three pieces. We hope all of you had a wonderful and joyous Holiday Season! or Click the PayPal Button to make a Secure Electronic Donation. THANK YOU!